Assisting 13707808 developers since 2005. 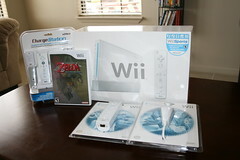 This past weekend in Corpus Christi, I finally broke down and purchased a Nintendo Wii. 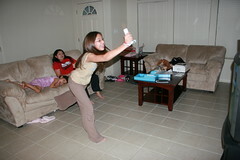 So all Saturday night we played Wii Sports, bowling, tennis, boxing etc. It was rather fun to watch Priscilla and Nicole go at it. Here is a picture of Nicole doing some crazy bowling. A totally great way for everyone to play and interact. I'm happy with my purchase. Luckyy. I am so completely jealous. An awesome and fun system. Gotta love the playability with the family!